Three weeks ago I had a new client come to see me. 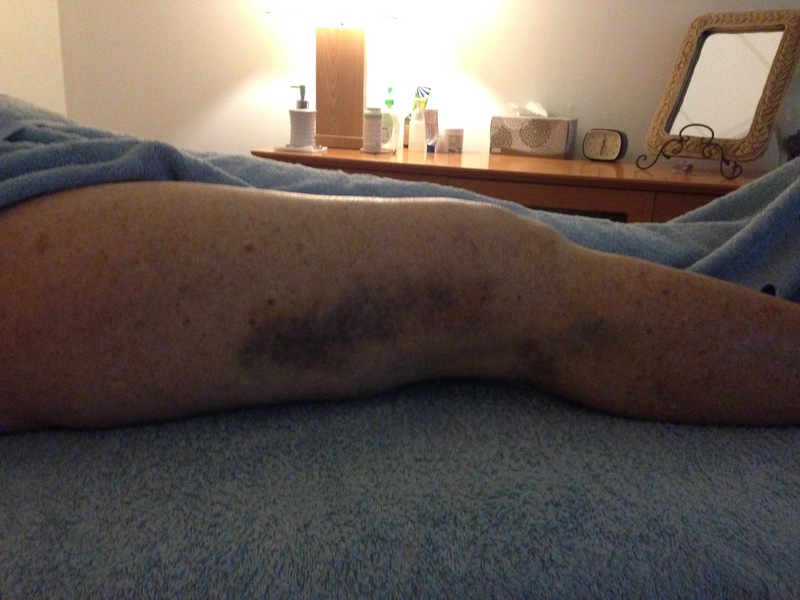 Denise is a 63-year-old woman who had a sore, bruised and swollen thigh. Her upper leg started to swell on Christmas Day for no reason at all. 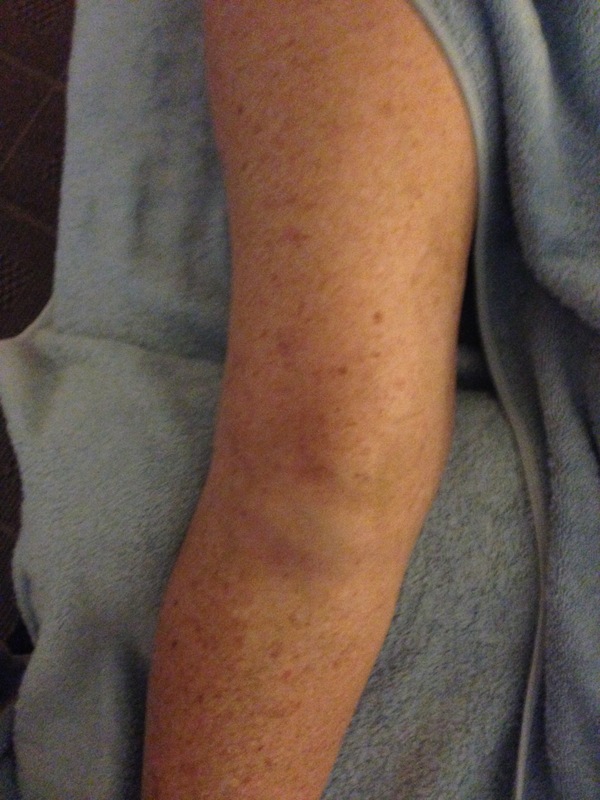 She had a large lump/bump laterally on her knee. She was sent for various tests … an MRI, ultrasound, x-ray … all were clear. 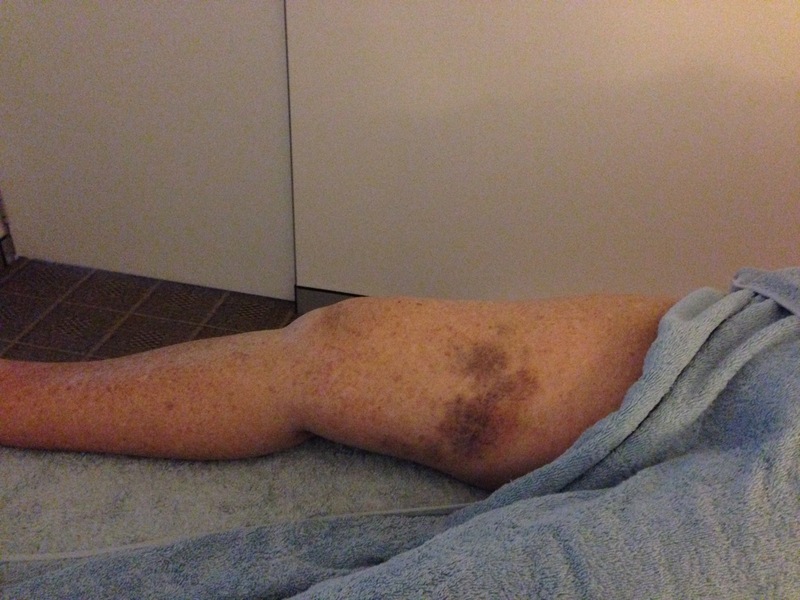 Then, about ten days before coming to see me, Denise developed bruises down her thigh. No injury. No trauma of any kind. Her doctor took a sample of fluid from the swelling on her knee and found that it was actually dried blood – that was tested and given the all clear. The last injury she could remember on her leg was a “cork” she’d received over forty years before. Her doctor thought that perhaps the blood came from that incident but there was no conclusive evidence. She had not been able to weight-bear the week before coming to see me, her leg had been too swollen and painful. Her knee was so painful it had stopped her from playing lawn bowls and she couldn’t bend it to go up and down stairs. Lawn bowls is the only exercise she’s been able to get since she had back issues three years ago, when she spent three weeks in hospital and walked for six months with a stick. 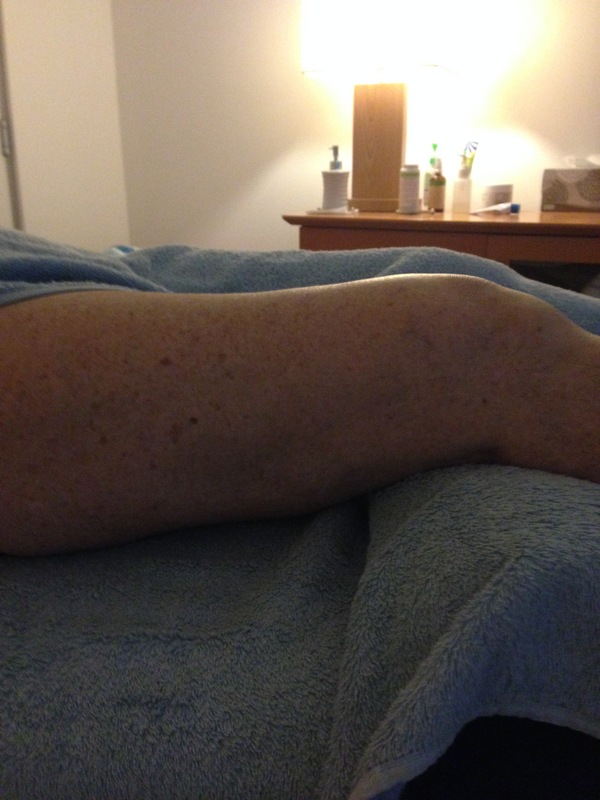 Denise was given a referral to see a knee specialist after a scan showed a possible bone on bone scenario, the report basically said she needed to get a new knee, but her GP disagreed with that finding and felt she needed another opinion. The specialist looked at her scans and agreed, her knees were fine and they were not the cause of her problems. She has multiple health issues including a prior clot that had made its way to her lung and polycystic and multi cystic kidney disease. But none of these could be responsible for her leg swelling. What brought Denise to me was a segment on A Current Affair called “Neck Pain No More” which featured Low Level Laser treatment for a number of conditions. She had called the business featured in the segment and her name and number was taken but they were so overwhelmed with enquiries, they said they’d call her back (they still haven’t). Two weeks later she was in my clinic because she had done a google search and found that I had a Low Level Laser. I’d post a link to the segment but when I tried to watch it online I could find the text but the video was incorrect (I have written to ACA to ask them to fix it, they are working on it). 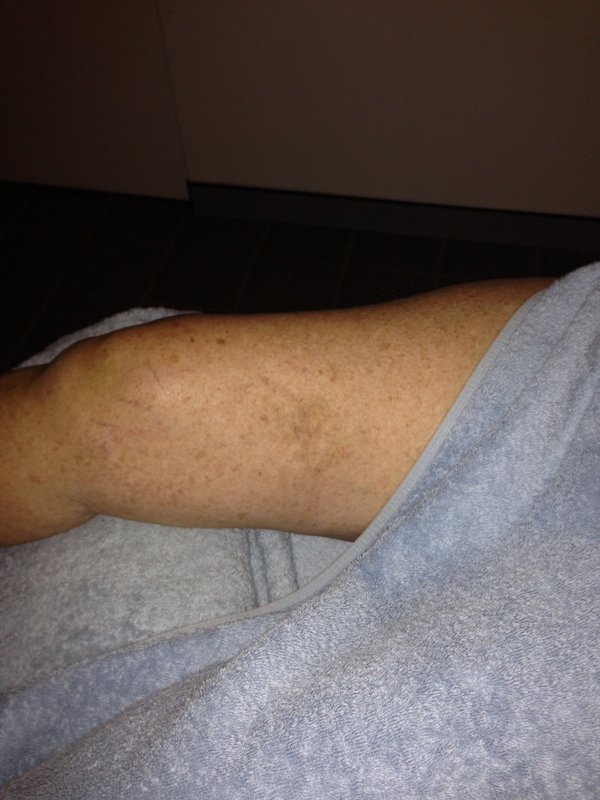 So, here are some photos of Denise’s leg when she came to my clinic that first day. We decided to do some manual lymphatic drainage as well as laser and Denise wanted to work intensively, as she was going away for three months and wanted to feel better before she went. The trip was in two weeks from the day she came to me. That first day we did 15 minutes of laser and the rest was lymphatic drainage. At the start her knee was painful when I touched it but by the end of the session her pain levels were down. We did four treatments the first week and three the second, increasing the amount of laser to 25 minutes. Each day the swelling and bruising reduced. Most days she felt her walking improved but the bending was still restricted. By the fourth treatment she felt she could get out of chairs easier. At the fifth treatment the bruising was almost gone and the ladies at the bowling club had “diagnosed” her with bursitis. She had gone home and googled the condition and felt it fit for her. I must point out, this is not a medical diagnosis, it’s peer diagnosis. But she was happy with that. By the last treatment she could get in and out of her car much easier and the bruising was gone and swelling was down. She was a happy lady when she set off on her trip. Here are some photos taken on her final treatment. Visit my website here for more information on the different techniques I use.